My friend since 8th grade Sarah (yes we share the same name), came all the way from Hawaii to visit this summer. I adore Sarah. She is one of those friends whom I will have all my life. We hadn't seen each other for three years and we were able to pick up like we'd seen each other just yesterday. Her trip was a whirlwind and so much fun. We snuck off without the baby for one night and grabbed dinner and a beer at the Amigo Lounge in Great Falls. Oh yum. 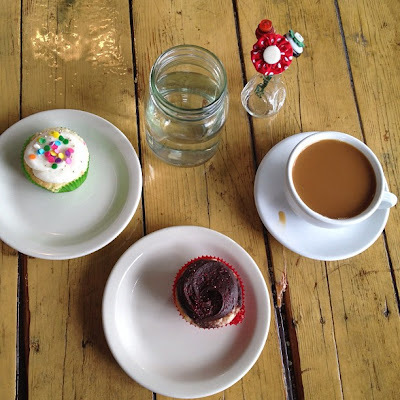 I showed her around the G Funk the next day, stopping off at my favorite coffee and cupcake shop, The Crooked Tree. Then we headed back to Helena and grabbed some dinner with my parents before mapping out our next excursion. We planned out the next day and titled it "Yellowstone on Crack." We got up early the next morning and drove to Yellowstone where we basically flew as fast as we could through the park. Here is the first portion of our day. How man can you count? I count six. I can't tell you how intoxicating the smell of sulphur was here. Mmmm nothing like a nice fart smell to overpower you. Proof that Sarah was there. I'm tripping you guys out right now with a SIDEWAYS picture. Whooooa! And it's kind of full body, which is a big deal because I'm really trying to avoid all pictures at the moment until I get a little more svelte. I did throw Gib in front of me to help hide the extra fluff I have from having him. Aaaaaah. I love nature. That rock formation looked almost fake so I had to take a picture for proof. I had NO idea you were taking my picture from behind. I guess that's my payback for getting a full body shot, eh?! Haha! Man, that was a FUN trip! I miss you, buddy!